"This easy and quick meal is so tasty it will have you coming back for seconds. 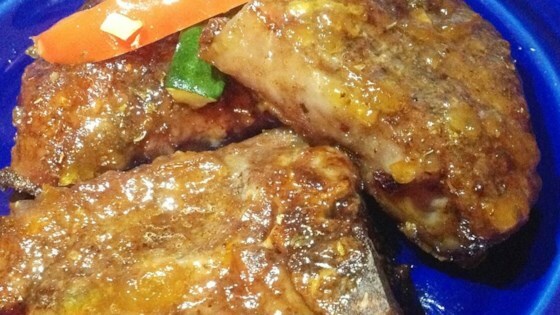 Tender lamb chops in a delicious and sweet duck sauce can be served with rice or mashed potatoes and a vegetable." Arrange lamb chops in a medium baking dish, and evenly coat with Worcestershire sauce, adobo seasoning, and cayenne pepper. Season with salt and pepper. Cover lamb chops with duck sauce, and continue baking 15 to 20 minutes, to an internal temperature of 145 degrees F (65 degrees C). Tasty lamb chops are cooked on the stovetop with a tasty balsamic sauce. I also couldn't find adoboe seasoning, so I found a recipe online. 4 cloves garlic 1tsp peppercorns, 1tsp dried oregano, 1tsp salt, 1/2 tsp paprika. Grind all ingredients in mortor & pestle. There's no such thing here as duck sauce, but I read that it is really plum sauce, so I used that instead. It was really good, recommended.